Margaret Muñoz-Lucero walks down the aisle of the Iglesia de San Antonio Catholic Church in Tiffany as she did when she was a child. The church, built in 1928, has been nominated for the Colorado Preservation Inc.’s Endangered Places program. 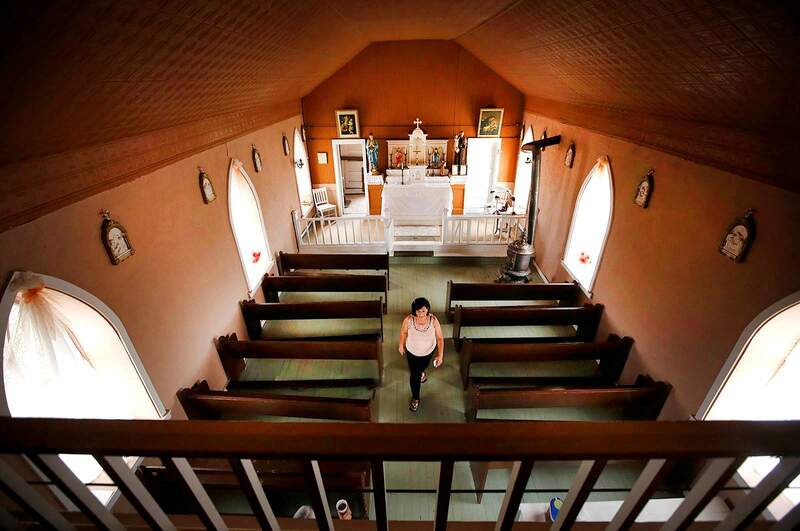 A small, almost forgotten Catholic church with a big history, located off the beaten path in the unincorporated community of Tiffany, could get a chance at second life as it approaches its centennial. “It’s just totally underappreciated and unknown by so many people,” said Ruth Lambert, a cultural program director with San Juan Mountains Association, a nonprofit geared toward public land stewardship and education. Lambert and others invested in the preservation of the Tiffany church submitted a nomination this week to place it in Colorado Preservation Inc.’s Endangered Places program. If listed, the Igelsia de San Antonio Catholic Church could be eligible for a number of opportunities for restoration and preservation. Built in 1928The Iglesia de San Antonio Catholic Church in Tiffany was built in 1928, about 35 miles southeast of Durango, along what’s now Colorado Highway 151. As early as the 1870s, Hispanic people from northern New Mexico and the San Luis Valley migrated along the San Juan River, settling in small towns that flourished over the next two decades. But in the early 1900s, the U.S. Bureau of Reclamation displaced many of these communities in its attempt across the American West to develop water storage projects through major dams and water diversions. Many people moved into the southern part of La Plata County, especially the Tiffany area, where they could buy homesteads that were not claimed by Native American tribal members. The Tiffany church served these people and regularly held services until 1972 when Masses were transferred to the Catholic church in Ignacio. The Iglesia de San Antonio Catholic Church is crumbling on the outside, but the interior is well-preserved. Today, it also stands as the last homage to the Hispanic community in Tiffany, especially after the Abeyto dance hall burned down in 2015. Margaret Muñoz-Lucero was born in 1957 and grew up in Tiffany. Although her family moved around the Four Corners, they always made a point to attend the Feast of St. Anthony celebration at the Tiffany church every June. “The pews would be full,” Muñoz-Lucero said. Families at the time would pass around caretaking responsibilities for the church. In the late 1960s, it was Muñoz-Lucero’s parents’ turn, and they didn’t relinquish responsibility for the next 10 years or so. Muñoz-Lucero moved away in the mid-1970s, and although she would try to come back for the St. Anthony’s feast, overall participation at the church began to wane. “Families that grew up around this area started to move away,” Muñoz-Lucero said. The once-thriving church started to deteriorate and be forgotten. That all changed in 2012, however, when Muñoz-Lucero moved back to Tiffany and immediately took on the role of caretaker. Crumbling exterior, beautiful interiorOver the years, there have been no modern additions or significant changes to the church. The bell tower, the organ in the loft, the confessional, altarpieces and pews are intact and original. But the foundation is iffy, Muñoz-Lucero said. And there’s a long wish list of fixes, including installing electricity, drilling a well for water, graveling the parking lot – to name a few. 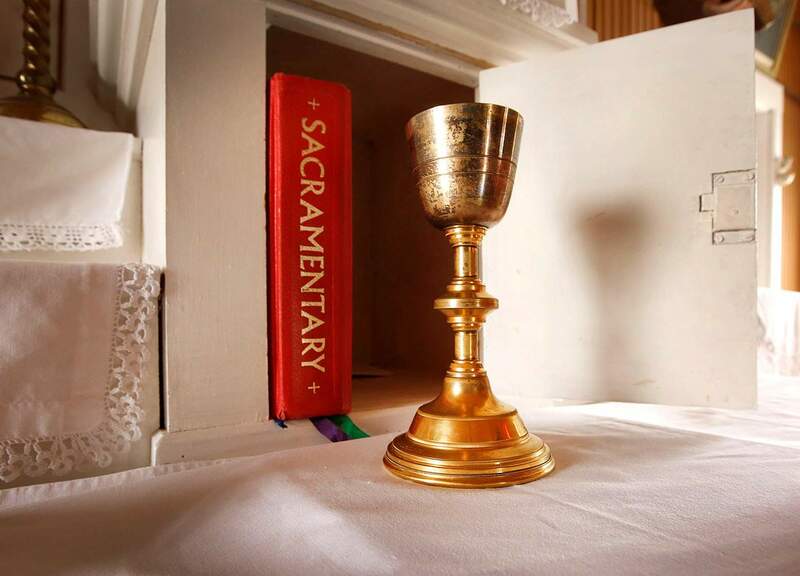 A chalice is kept locked in the altar at the Iglesia de San Antonio Church in Tiffany. Kim Grant, director of Colorado Preservation Inc.’s Endangered Places program, said about 20 sites were nominated this year across the state to be included on the historic places list. After a site is nominated, the organization assigns a person to review the location, take a tour and talk to the people interested in preservation to identify what the threats are to the place. In June, Grant and others were on a historic tour of Southwest Colorado and visited the Tiffany church. Grant said one thing was clear on the tour: The local community has a huge interest and passion to share the church and work together to preserve it. Sites selected for the Endangered Places program are announced in February, and there’s still extensive review work to be done, Grant said. “It’s a small, modest enough project that I’m optimistic it’d be saved or restored,” he said. Lambert said if the Tiffany church is included in the Endangered Places program, she would like to get it listed on the National Register of Historic Places in La Plata County, which would open up grant opportunities. Building communitySince Muñoz-Lucero returned as caretaker, she has been holding the Feast of St. Anthony. Her first year in 2012, about 45 people attended. This past June, about 85 people showed up. And it’s not attended by just Hispanic residents with deep roots in the area. More people from all walks of life are showing up, Muñoz-Lucero said. St. Anthony is considered the saint of lost items. What namesake could be more fitting for a small church in Southwest Colorado that’s experiencing a renaissance as it nears 100 years old? “I really want it to keep it standing as a historical place for the community we’re in, and the future community that’ll come in,” she said. 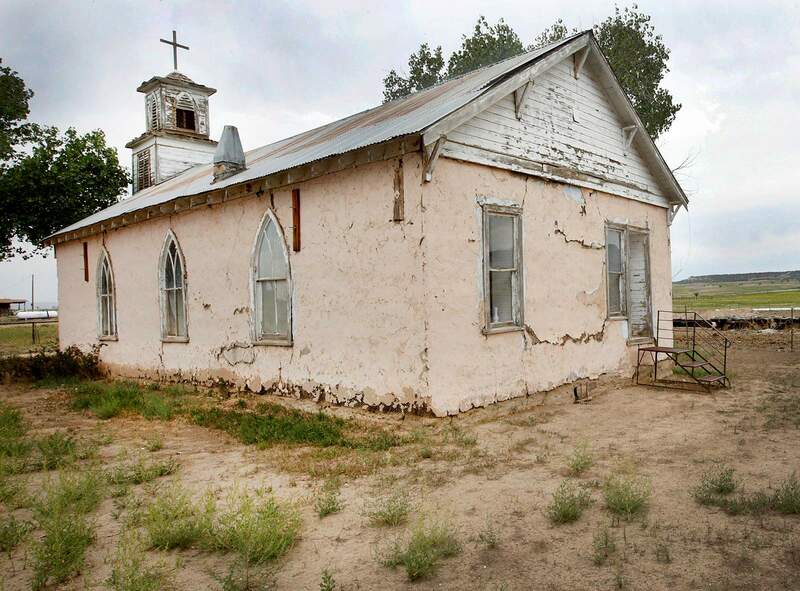 Iglesia de San Antonio Catholic Church Preservationists have nominated this rural church in southeastern La Plata County for a state endangered places program. Preservationists have nominated this rural church in southeastern La Plata County for a state endangered places program.